If you want to buy your husband a watch that he can wear everywhere and keep for years, you must look at the TAG Heuer Aquaracer collection. These men’s watches are traditional in design and exceptional in function and quality. There is nothing that will put a smile on his face faster than a TAG Heuer timepiece, and this one has it all. The TAG Heuer Aquaracer Men’s Watch model WAJ1111.BA0871 is styled to be easy to read, as well as fashionable. For those of you who think that their guys don’t consider fashion, wake up…they want to look good just like we do, and this watch will help with that. 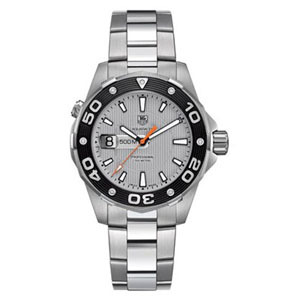 The Aquaracer men’s watch is a mid-priced timepiece from TAG Heuer. It is Swiss Quartz run and offers precision and accuracy. The dial is fitted with a date window, and a scratch resistant sapphire crystal. As the name implies, the TAG Heuer Aquaracer watches are highly water tight. This model is water resistant to an impressive 500 meters. The screw in crown and screw down case backing help to make this watch more water tight. In addition to the exceptional functionality of this piece, the WAJ1111.BA0871 Aquaracer Men’s watch is perfect for the man on the go. Check out the entire Aquaracer line!